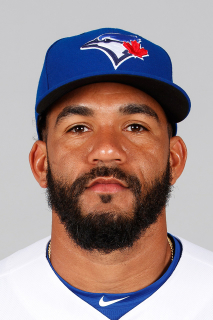 Devon Travis was 2-3 at the plate with a pair of RBI as the Blue Jays defeated the Phillies 5-3 to take the series win. The Blue Jays took the lead in the top of the second as Devon Travis doubled home Russell Martin and Dwight Smith Jr.
JA Happ was his usual solid self. He mostly cruised through the first 5 innings, retiring nine of the first tend batters he faced. Happ's only stressful inning was the 6th when he allowed 3 runs on 4 hits and a couple of errors. Happ was 0-3 at the plate with a pair of strikeouts, and his average is still .333. The bullpen looked good today. Seunghwan Oh retired all 4 batters he faced and Ryan Tepera faced the minimum number of batters thanks to a game-ending DP. Kevin Pillar was snakebitten today as he was robbed of some hits thanks to some good Phillies defense. Up next, the Blue Jays travel to Boston where they face the Red Sox at Fenway. Tomorrow's pitching match-up features ex-Jay David Price against Blue Jays righty Aaron Sanchez. Price beat the Blue Jays with 5.1 innings of 2 hits ball 2 weeks ago. The Blue Jays will be looking to exact revenge tomorrow.